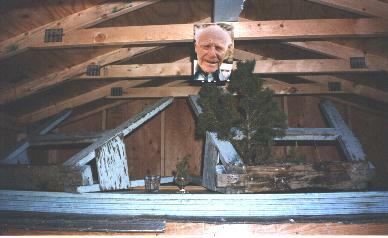 Inside Grandpa Bredo's House....Circa 1999 Have you ever wondered what was inside Grandpa's shed? Welcome to a short guided tour of the environment of Grandpa Bredo. DTI is the company charged with maintaining the environment of a cryogenically frozen body, in order that it might be Re-Animated at some future time when it will be possible to repair damage to the physical body using nano-technology. Our client, Trygve Bauge, is very concerned that something might happen to his Grandfather and ruin his chances of Re-Animation. If we make a mistake, we run the risk of depriving Grandpa Bredo of this chance at life......essentially "killing" him. 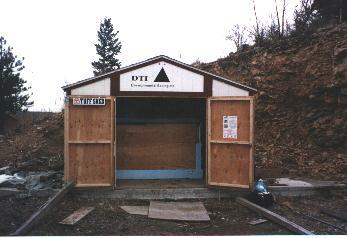 Although unusual, we take our job and responsibility very seriously here at DTI. The first and last sight we see is the picture of Grandpa Bredo we have to remind us that we are taking care of someone's "life". Underneath his picture is the evergreen bough we put up for the christmas season last year, along with two glasses we keep around for toasting Grandpa. (Of course, the drink of choice is Old Grand Dad over (dry) ice.....;-) The two sawhorses are for weight, to keep the lid flat and tight. 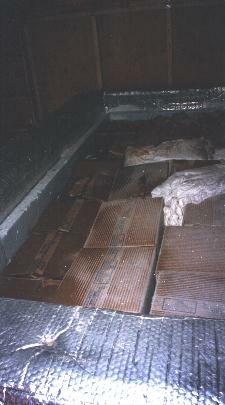 The entire freezer box is lined with a special heat reflective bubble plastic insulation. 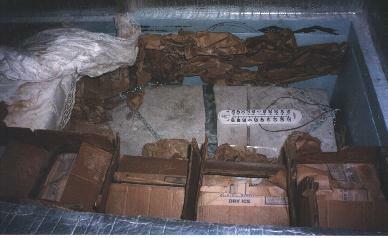 The insides of the freezer box are seen in this image....... It is filled with cardboard boxes that hold the dry ice. There is as much packing placed around everything as can be gotten into the freezer box. The packing keeps the air flow down as much as possible. Airflow sublimes the CO2 faster than temperature. The white mass seen in both images is the burial shroud and pillow that are traditional in Norway. In the second image, you can see the actual casket with the thermometer on top to monitor the temperature at that point. It usually hovers around -60F. The wide black band is a strap of metal used to reinforce the aluminum casket. Note the chain wrapped around the casket. It was used to lower the casket into the box and is left there to facilitate the eventual removal of the casket. 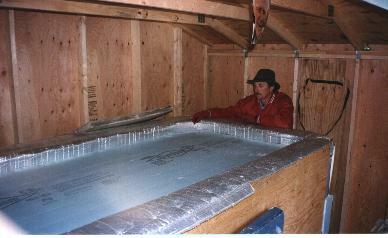 The final task is to load the ice. we remove all the old pieces and place them into one or two of the boxes, then load the new 60 pound blocks into all the other empty boxes. Sometimes there are 15-20 pieces ranging from 5-35 pounds. 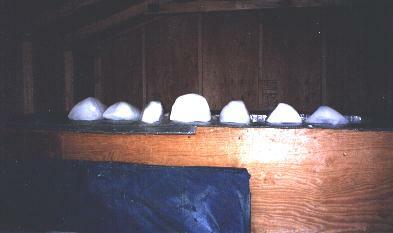 After packing in the ice, we very carefully re-pack all the insulation in it's numerous layers. The object is to try and get as good a seal as possible around the edges. We even re-use several of the KFOX Radio banners that were left behind as flexible edge seal fins and plastic liners between the layers of insulation. There's even an Annual Festival in Nederland for the Guy they once wanted to boot out of town!